Fresh on the heels of the announcement and partial release of Windows Phone 8.1, Microsoft has a new dose of code for users of its smartphone platform: Update 1. Akin to Update 1 for Windows 8.1, Update 1 for Windows Phone 8.1 contains a welcome mix of quality of life and feature upgrades. I haven’t had any hands-on time with the code, so consider this post a preliminary look at what Microsoft has built. We’ll have more soon. Chief among the updates is Cortana heading to new markets. Microsoft is bringing Cortana in beta to China and the United Kingdom, and in alpha to Canada, India and Australia. 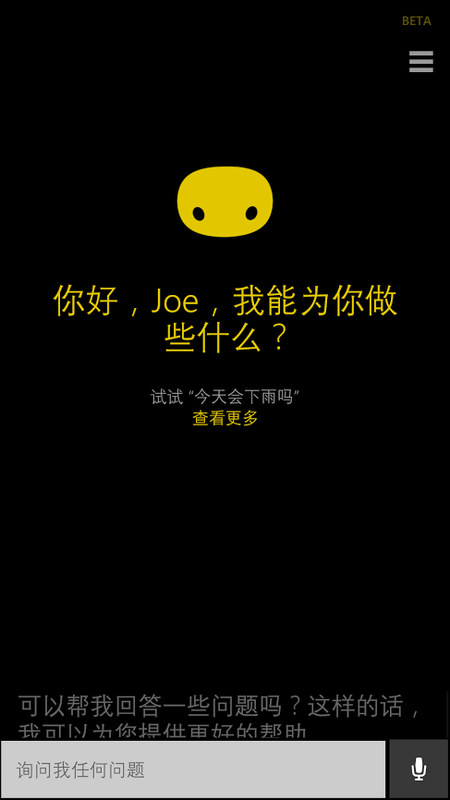 Microsoft did yeoman’s work to prepare Cortana for the Chinese market, which I spoke to the company about that effort. As far as I can tell, Microsoft thinks that Windows Phone could do well in China, so it’s investing in bringing what it considers to be a keystone feature — Cortana — to that market as full-strength as it can. To do that it had to tailor the feature to that country’s culture and language. Windows Phone’s market share in China is around 1 percent, a figure that is off about 50 percent from 2013. Cortana in China will, of course, support Mandarin and simplified characters, but also contains features that make it better suited to its new market: data relating to temperature change and air quality; a less formal personality; warnings on driving restrictions; and information relating to the location of celebrities. I’ll reserve the balance of my notes on the Chinese version of Cortana for when I’ve had some time to play with it in person, or at least seen extensive video of it in action. Microsoft’s investment in localizing Cortana makes sense given the potential size of the Chinese market for Windows Phone; if Microsoft can crack the market and garner material market share, it can greatly boost its unit volume, making its platform more attractive to developers. The release of Cortana into alpha and beta in other markets will be an interesting moment for the platform. Can its introduction help drive unit volume? Microsoft has hardware and software assets in place, looking for a larger audience. The alpha programs will be opt-in, implying that their initial user bases will be constrained. Update 1 for Windows 8.1 will be made available to developers next week. It will follow a roll-out pattern similar to Windows Phone 8.1. Cortana is a big part of Update 1, but it isn’t the only thing that the set of upgrades will bring. As promised, Xbox Music, which has long been viewed as a tertiary offering from Microsoft, gets an update. According to the company, the new incarnation will include quicker load times and improved scrolling. We’ll have our fingers on the pulse of community reaction to these upgrades. Also included is App Corner, a way to better control what apps a device can use. If you have kids, that might be relevant to your interests. An improved Store tile is also updated; it’s now a Live Tile in and of itself. Users will also be able to stick apps into folders, called Live Folders. That change should allow for more customized home screens for power users. And, finally, Update 1 includes increased VPN support. You can see why that would matter given Microsoft’s focus on the Chinese market. That’s the briefest of overviews. TechCrunch will have more when we have the code on our handsets, so look for a video review in the near future. What matters in the above isn’t the feature set per se, but the rapidity with which the update has been developed and slated for release. It also underscores the fact that Microsoft is not backing down from its larger Windows Phone strategy. Given that the company recently closed on more than $7 billion of Nokia assets, that’s not a shock, but it is useful to understand from a strategic perspective. Update 1 brings what was good about Windows 8.1 to more people. Let’s see if it can move the needle.